Very hardy and easy to grow in full sun to partial shade location. 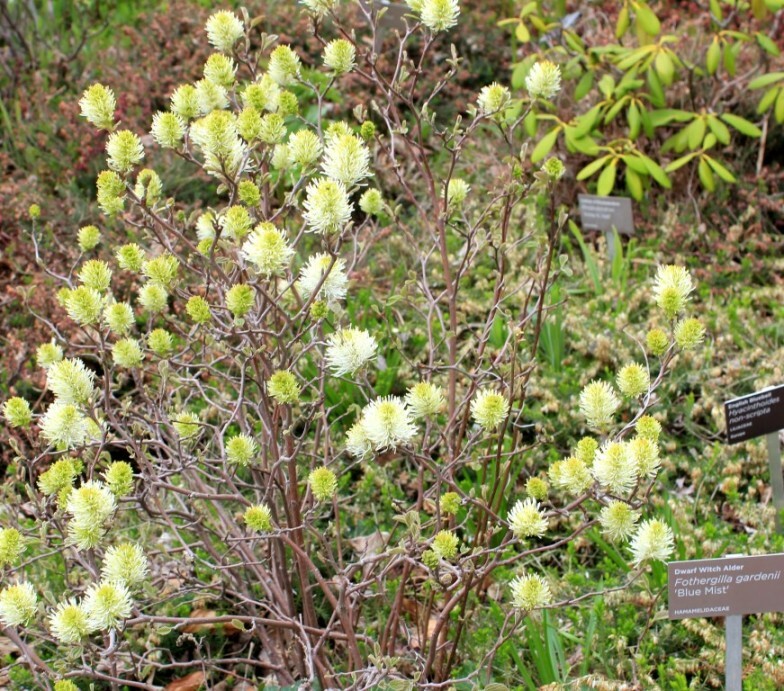 Fragrant white fuzzy flowers in spring. Stunning orange red fall colour! USDA Zones:4-8. Mature size:6′-10′(H) X 5′-10′(W). 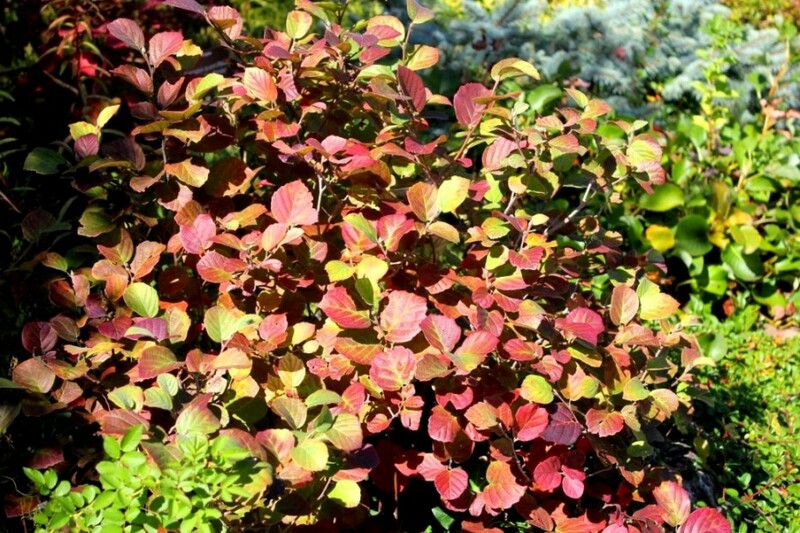 It is a shrub requires very low maintenance. 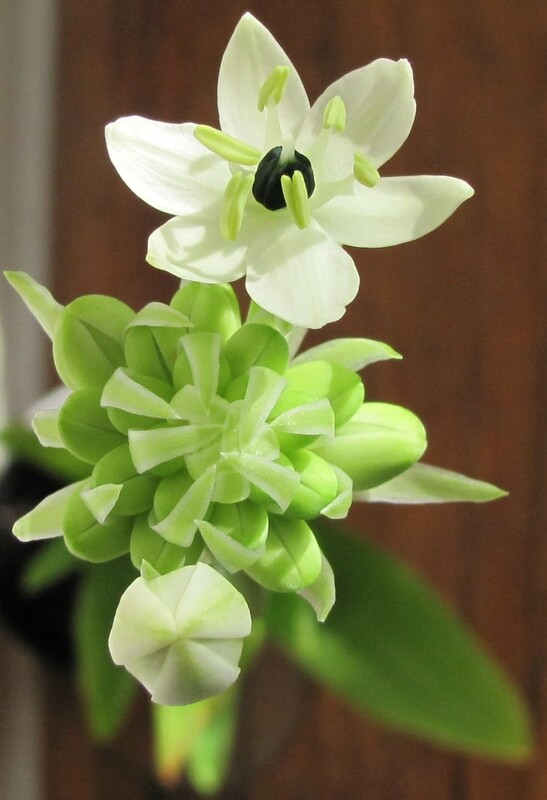 🙂 Propagate by soft wood cuttings. 非常強健容易栽種的灌木. 適合種植在全日照到半日照處. 春天開絮狀白色的香花. 秋色轉橘紅或紫紅很美豔. 耐寒. 成熟株高約6-10呎,寬幅約5-10呎. 是屬於不太需要庭園維護的灌木. 🙂 主要用嫩枝來扦插繁殖. Very hardy perennial. Easy to grow in any full sun location in well drained soil. 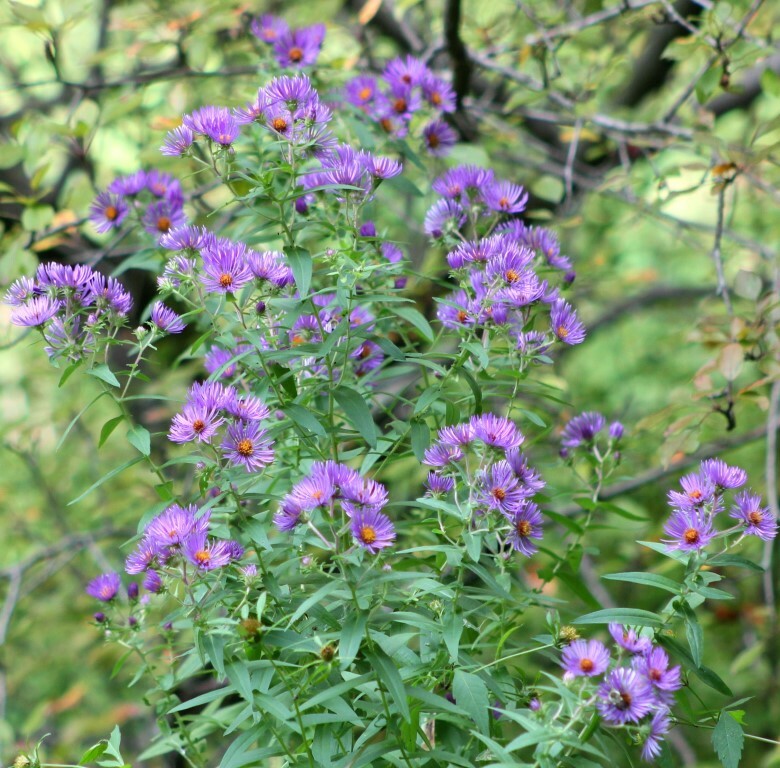 Large amount of small purple flowers in late summer to frost. Flowers attract bees and butterflies. 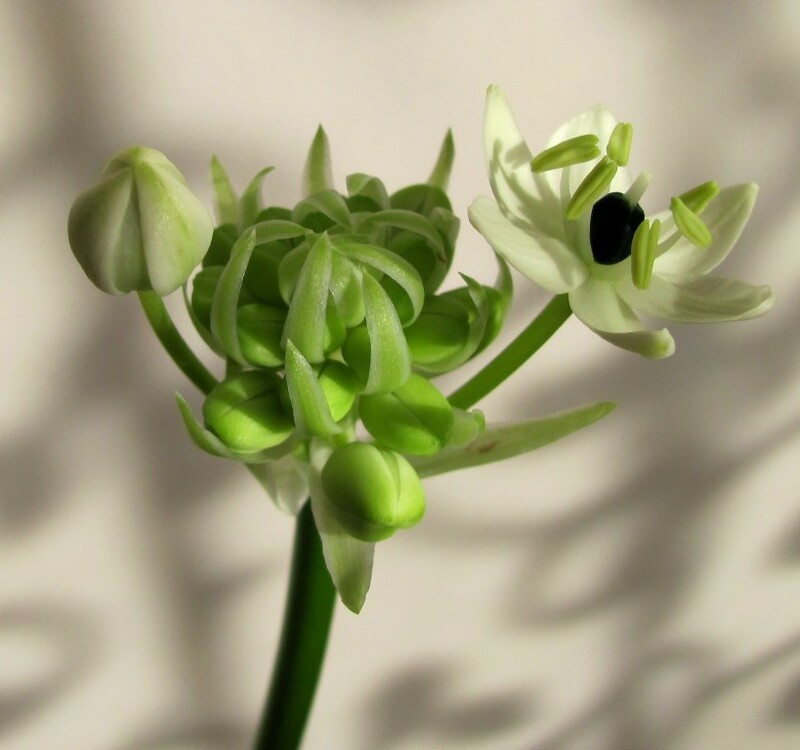 Flowers are excellent for cut flower. Easy to propagate by dividing plants in early spring or from seeds. USDA Zones: 4-9. The wild variety is usually taller. The cultivars are shorter. Fast growing, do not tolerant foot traffic. 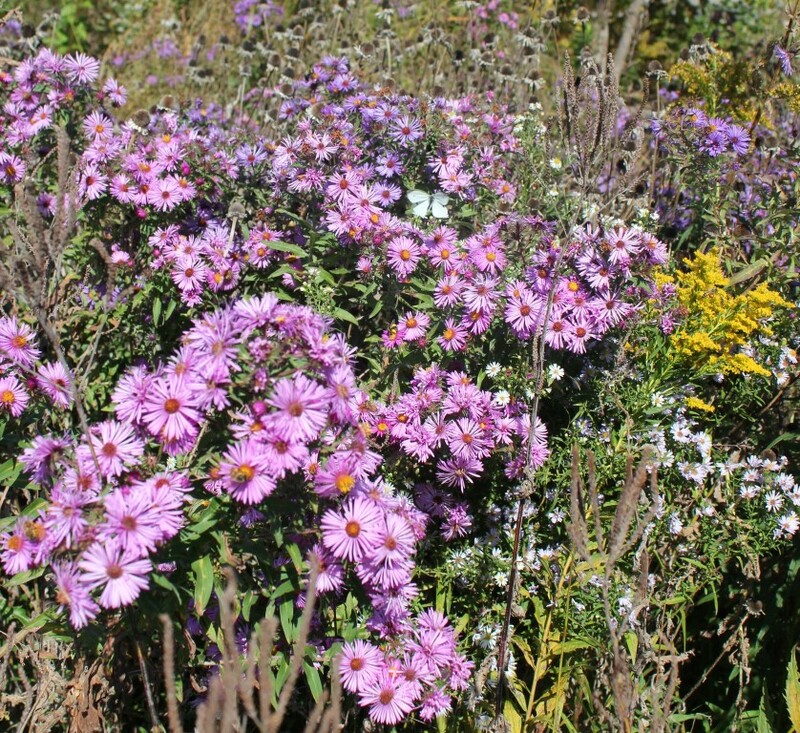 紫菀（Aster trinervius）菊科紫菀屬的植物, 非常強健的多年生草花. 容易栽種在任何全日照排水良好處. 夏末到霜降開大量小菊形紫花,花期很長,很適合切花,花頗吸引蜂蝶. 容易於春天時以分株或種子來繁殖. 耐寒也耐熱. 野生的株高較高,園藝種的較矮有矮性品種. 生長快速,不耐踩. 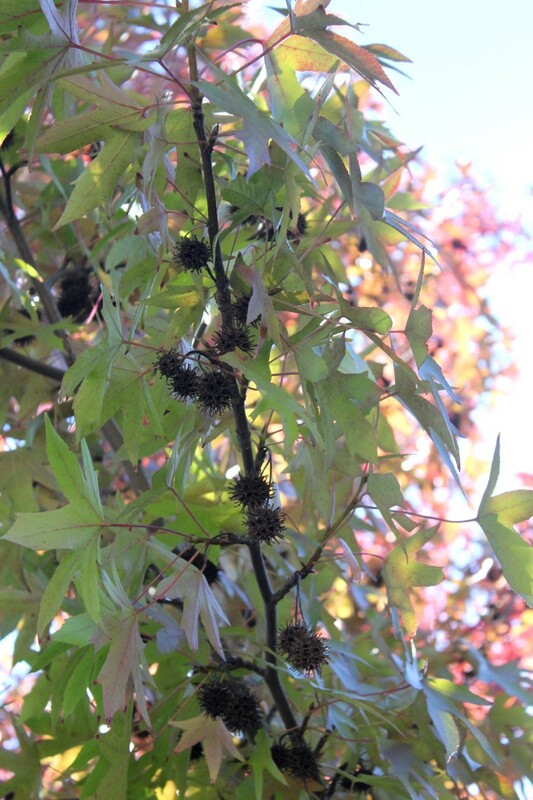 American Sweet Gum (Liquidambar styraciflua) is a large, native, deciduous tree that grows up to 60′-70′ tall. 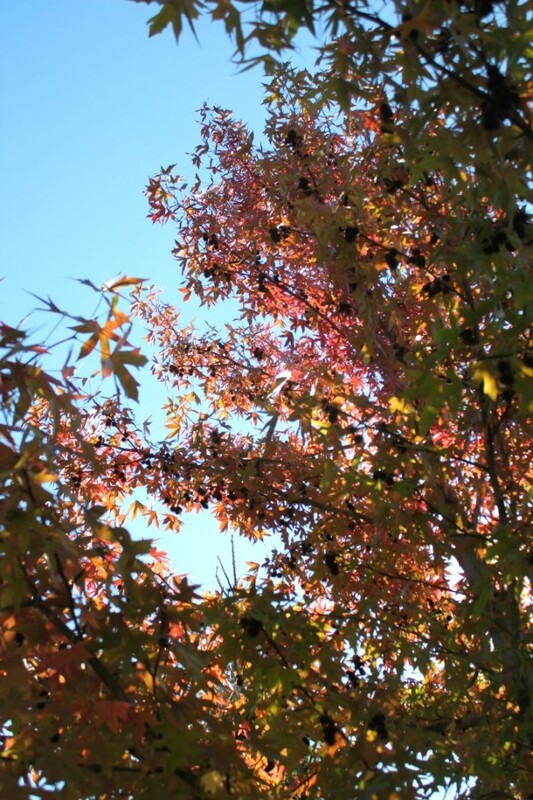 The leaves are 45′ wide. Easy to grow. Best grow in full sun location. USDA Zones:5-9. 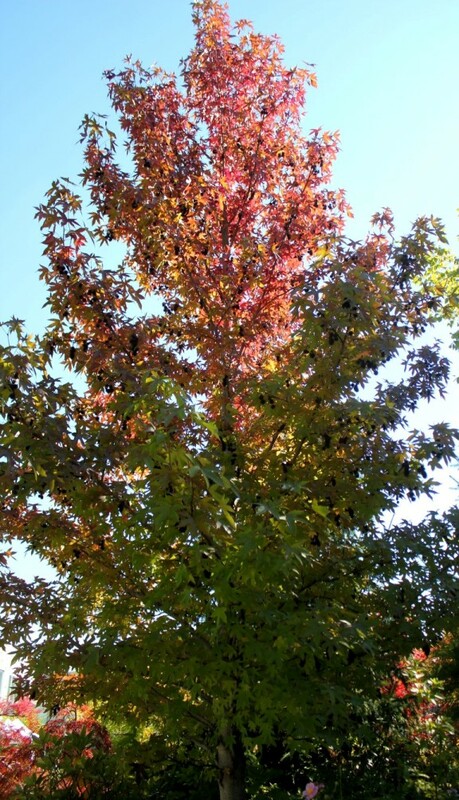 In fall, the green foliage turns orange red, quite stunning. Its hard wood is good for furniture. 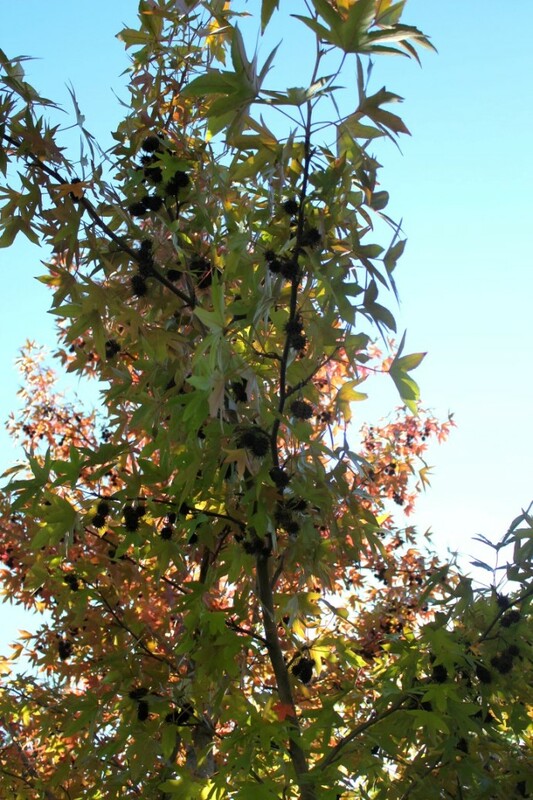 Its fruit and resin are valuable for medicinal uses. Easy to propagate from seeds, cuttings or grafting. 原生於北美東部. 算是大型的落葉喬木. 以全日照環境為佳. 容易栽種. 耐寒. 秋色葉由綠轉橘紅,相當耀眼. 木材是硬木很適合做傢俱. 楓果在中藥叫’路路通’,為婦科用藥. 其樹的乾燥樹脂為中藥’楓香脂’,別名楓脂、膠香、白膠、白膠香、芸香等,主要為止血止痛以及解毒. 成熟株高60-70呎,寬幅為45呎. 容易以種子,扦插或嫁接等方式來繁殖. 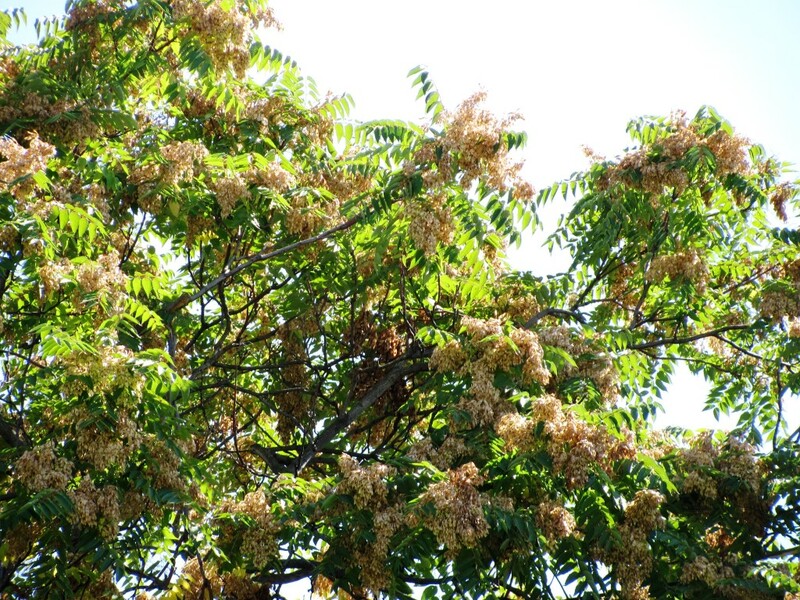 Tree-of-heaven (Ailanthus altissima) female tree is loaded with seed pods in fall.臭椿母樹秋天種莢成熟了. I believe almost everyone have seen it. Such common tree almost everywhere in the world. 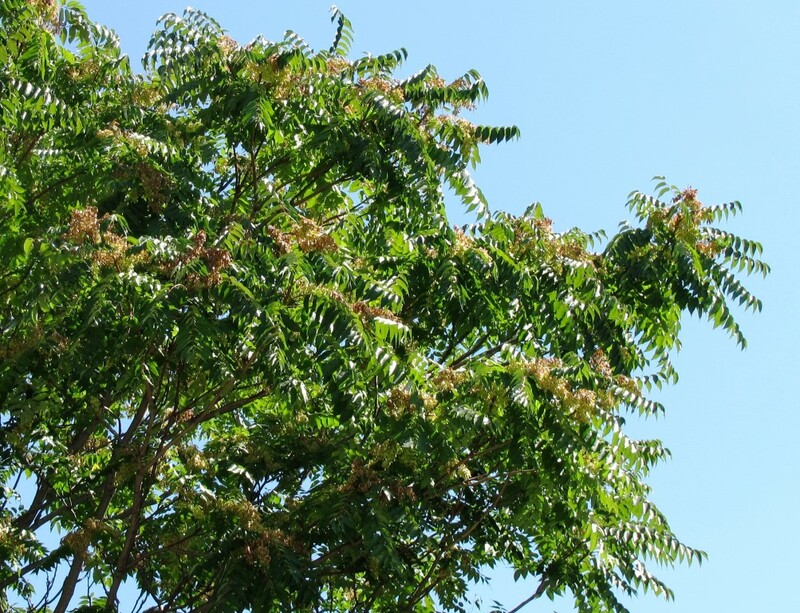 It is a fast growing, invasive tree. It is so weedy and also has foul odour. It is very difficult to get rid of it, so I hope people can weed the seedlings out. 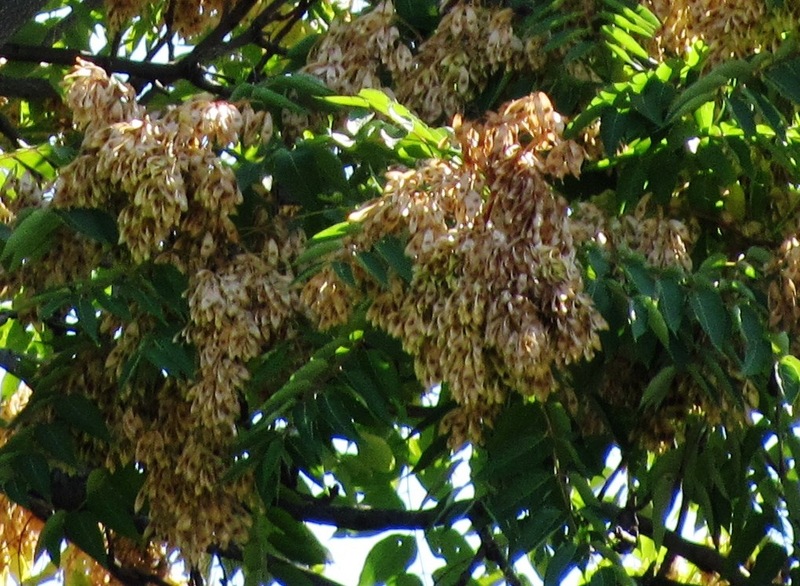 But it is still has its purpose: medicinal uses and breeding ground of Ailanthus silkmoth (Samia cynthia). 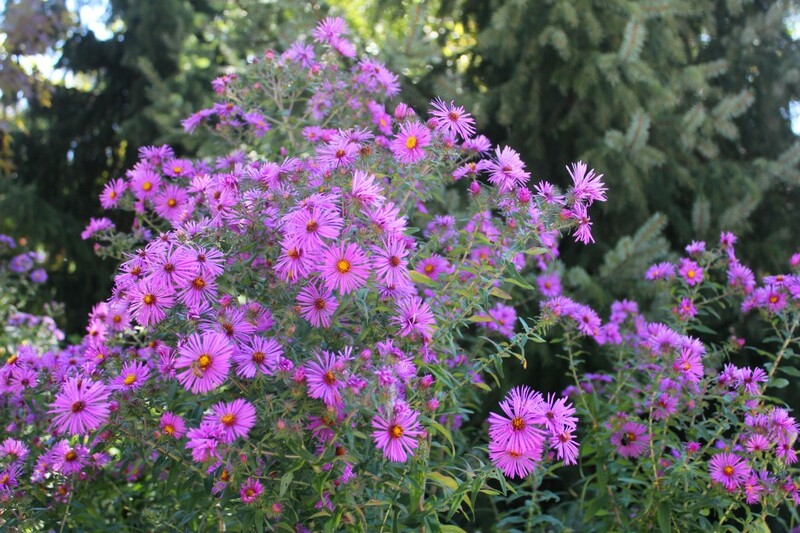 Very hardy, it can grow in any full sun to partial shade location. USDA Zones:5-8. Mature size:50′-80′(H) x 40′-60′(W). Self seed easily. 生長快速的雜樹之一,非常強勢. 能在全日照到半日照處生長. 植株有臭味. 當然它也不是一無是處. 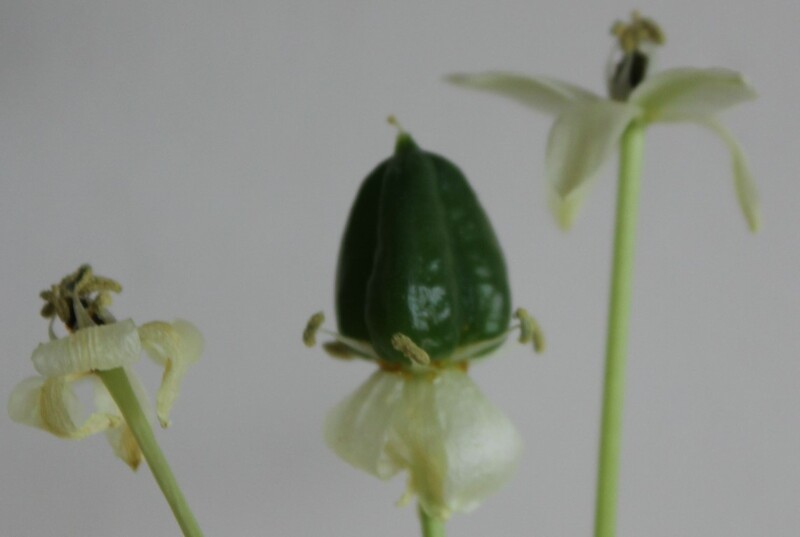 它是有其藥用價值(收斂劑)和樗蠶(Samia cynthia)產卵的植物. 不過這樹很難清除,常常再長出. 希望人們在除雜草時能將小苗清除. Glass Gem Corn — harvest time! (Zea mays) 寶石玉米 — 收成了! The second cob of glass gem corn. 寶石玉米第2穗收成了. The third cob of glass gem corn. 寶石玉米第3穗收成了. The 4th cob of glass gem corn. 寶石玉米第4穗收成了. 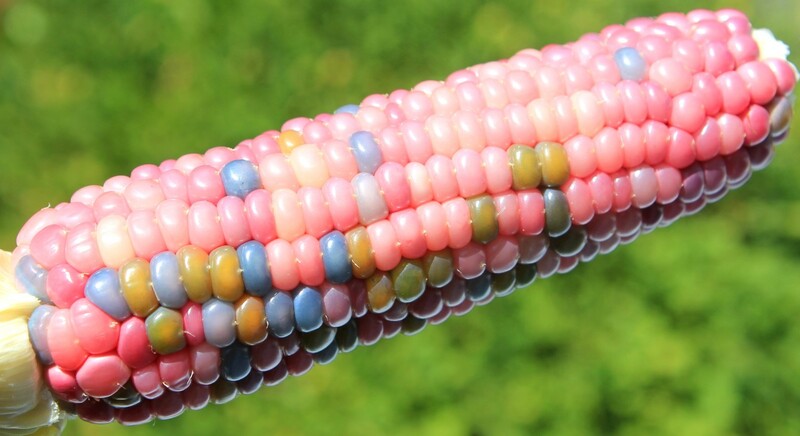 Beautiful and colorful glass gem corn kernels! 寶石玉米的美麗多彩玉米粒! 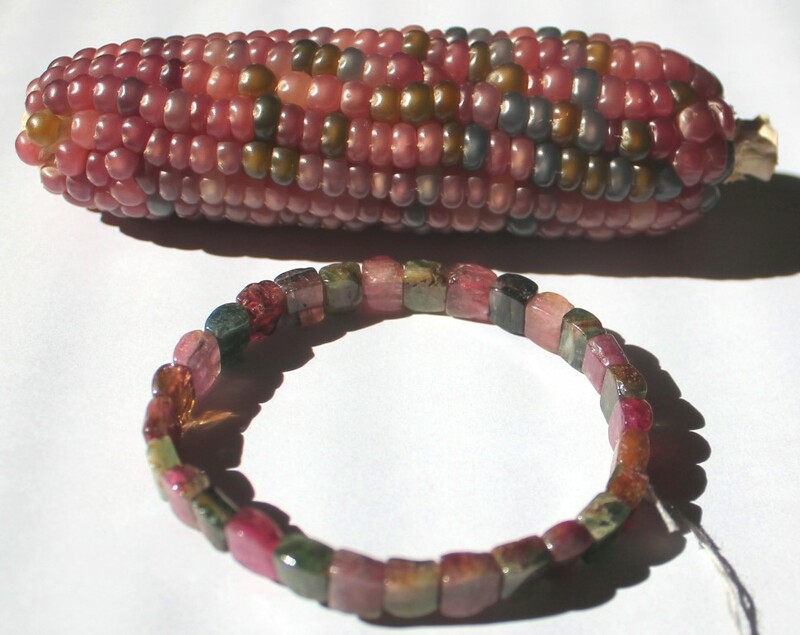 Glass Gem Corn and Tourmaline are all natural and so similar! 寶石玉米和電氣石(碧璽)都是天然的且有相似的花色. 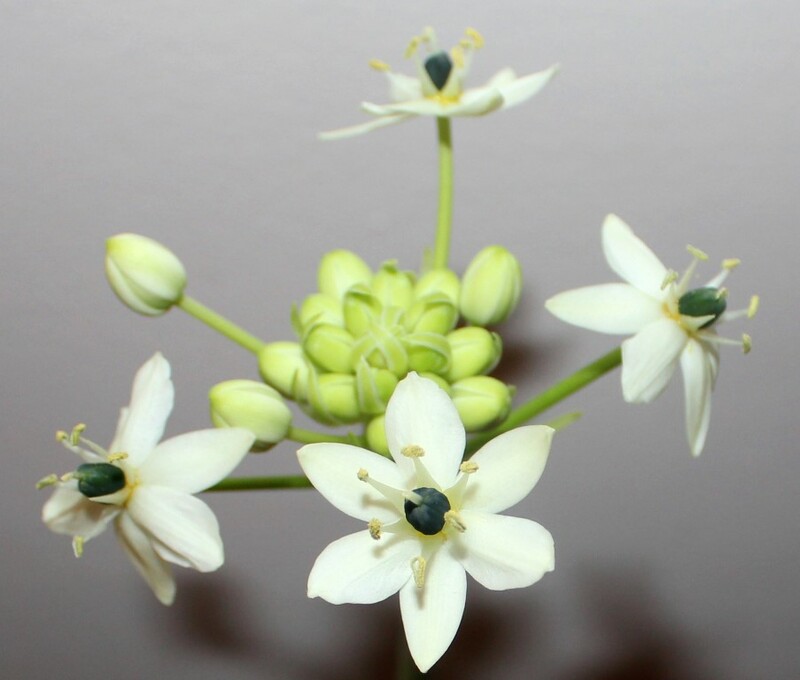 1.Corn plant has male and female flowers, usually the tassel (male) shows on the top first. It is annual. 2.Corn stigma is called “silk". 3.Female inflorescence is with young silk. After pollinated the silk turns dark and dry. 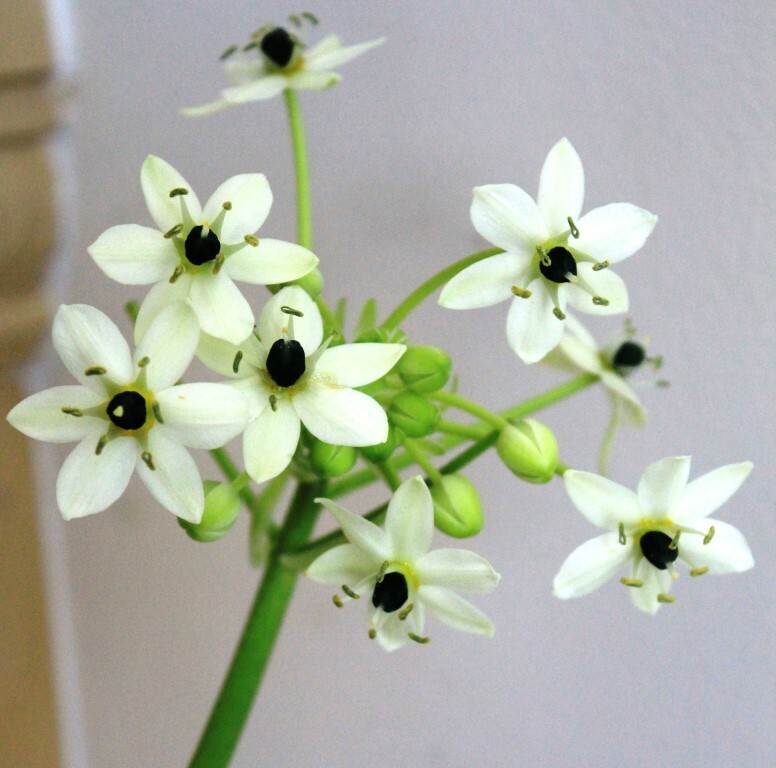 4.Many small male flowers make up the male inflorescence, called the tassel. 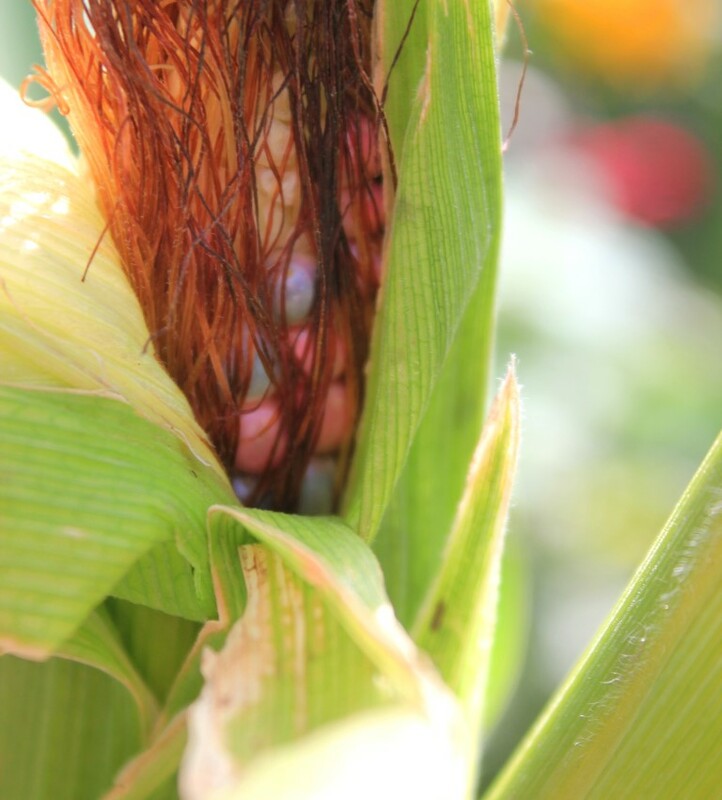 5.When corn cob matures the outside layers (husk) turn outward called ‘ears’. 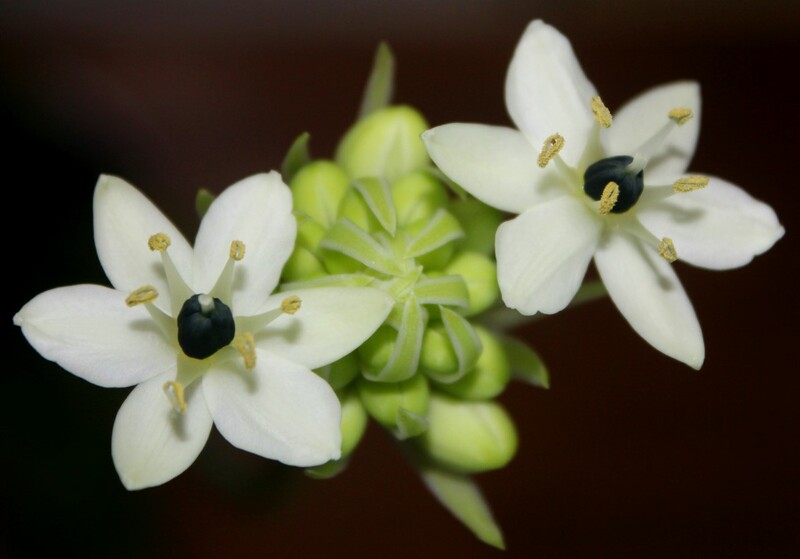 6.Hybrid corn (use different plant pollen to pollinate female flower) will have stronger gene which grow bigger and taller and able to grow more corn. 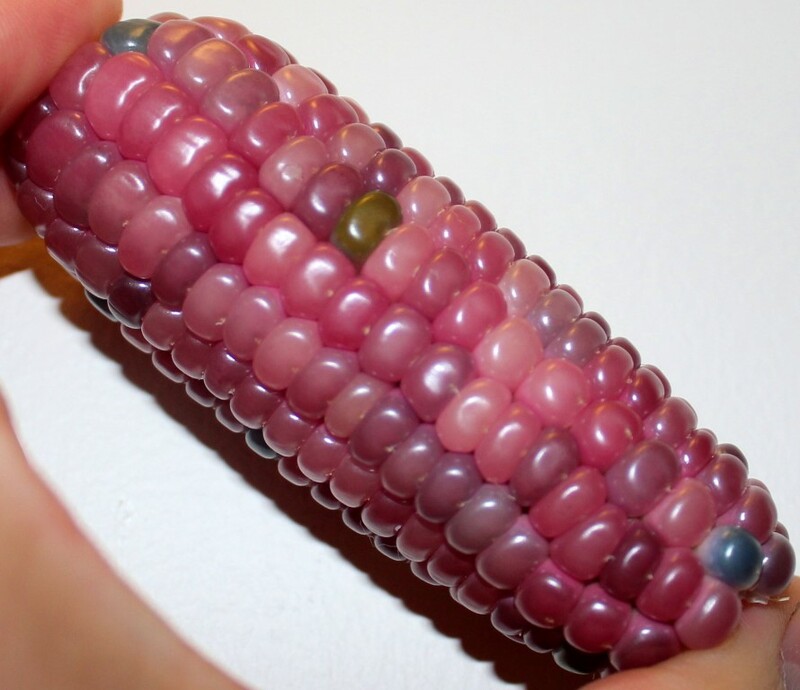 7.Glass gem corn is a native corn, not genetically modified. 8.Many different types of corn in the world are for different uses in food. Some with hard kernels are good for corn flour or for pop corn. Soft sweet kernels are good for quick cook vegetables. 9.About 90% of the corn grown in the US has been genetically modified. 10.Growing from seed to harvest usually takes around 3.5 months. 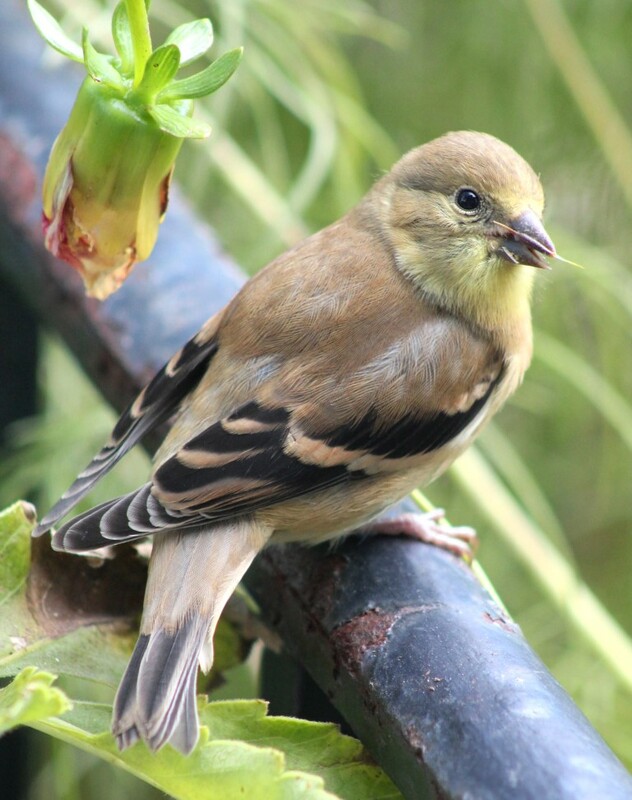 Outside of my front yard window, there are some goldfinches feeding on Cosmos seeds. –The Goldfinch is a small North American bird in the finch family. 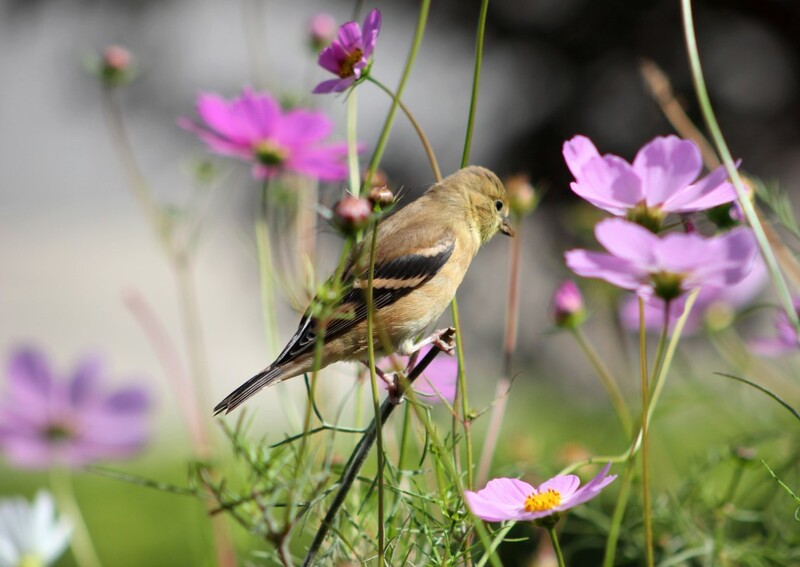 It is migratory song bird. It feeds on seeds. They are very shy. 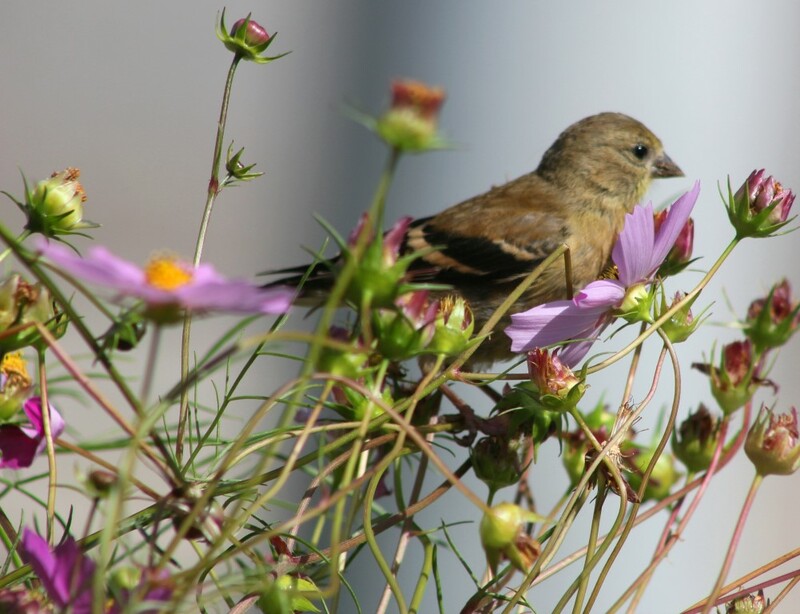 Cosmos are self-seeded annuals, I grow them for these birds to feed on.